Okinawa City is putting the final touches on preparations for this weekend’s Industrial Festival, a two-day combination of Okinawa products presentations and a host of family fun activities. The 31st annual Okinawa City Industrial Festival opens at 10 am Saturday, with activities slated until 7 pm. Sunday’s schedule is 10 a.m. to 6 p.m. 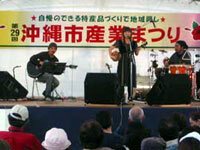 The principal festival theme is introducing Okinawa-made products to the island, but also wraps in dozens of entertainment and cultural events. The Industrial Festival Executive Committee is proud of its program, which will introduce Okinawa City products and processed goods, wooden handicrafts, Ryukyu musical instruments, homemade pottery, awamori, clothing, building materials and a mix of Okinawa foods and special goods. 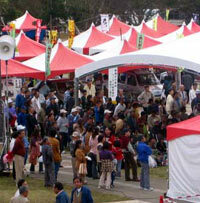 In some cases, festival visitors will have the chance to see Okinawa products being made, and can also purchase items right at the festival. Taiko drums begin beating at 10:45 a.m. Saturday, only minutes after opening ceremonies conclude. A noon seminar on how to plant orange trees is open to the public, followed by a jazz big band performance at 2 pm. Children’s sanshin and a hip hop dance show are also on tap later in the afternoon. A similar program is on tape Sunday. 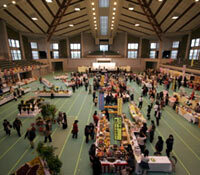 Special exhibitions and demonstrations are slated throughout the two-day festival. The Chibana Society for Study of Textiles offers demonstrations in textile making, while Chatan’s Bamboo Wares Studio will teach making bamboo products. Both are at 10 a.m. each day, along with a glass working demonstration, a lathe experience and a pictures demonstration. Food booths touting Okinawa’s home grown specialties will be scattered across the festival grounds at Okinawa Comprehensive Athletic Park and surrounding spaces. There will be exhibition works for sale, and even a lottery corner. Restaurant booths will offer up Okinawa soba, crab soup, various fried fish and even steaks.